So you wanna take some wind out of the sails of the craft beer movement, huh Big Beer? Well, before I tell you how to do that, let’s talk about what you don’t do by using the following example as a case study. In fact, Anheuser is banking that its customers are so dumb as to be completely ignorant that the double-talking mega brewery has been snapping up craft breweries over the last several years in an if-you-can’t-beat-‘em,-buy-‘em business strategy in order to cash in on the craft beer movement, a movement that has steadily been eating away at Budweiser’s shrinking profit margins. Luckily for AB, not everyone saw their $8 million backfiring blunder— only about 120 million people. Seriously, AB, if you wanted to know how to take the craft beer movement down a peg, you could have just asked me— and it’s not by pitching a MACRO-VS-MICRO change of perception ploy. If we apply the above principle to Budweiser’s recent shot at craft beer, we might chalk one big point up to craft beer for simply stepping out of the way while Bud proceeded to shoot itself squarely in the foot. So how can Big Beer use Sun Tzu’s principles to their advantage? First, take a cue from Sun Tzu and Know Thyself. If you’re saying that you’re embracing craft beer, then embrace craft beer. In AB’s case, sending a mixed message to its audience about how the brewing giant is both anti and pro craft beer makes Anheuser sound confused at best, and patronizing or hypocritical at worst. At this point, quite a bit of damage control would need to be done before the public are going to “trust” that AB is into craft beer for the sake of craft beer, and not just as part of their corporate strategy to make up for their steadily declining sales of Budweiser. Or maybe Anheuser is right, and its customer base, like the company, is just too oblivious to notice or care that they’re perceived as dumb-dumbs. I can see the next Bud slogan already: Budweiser-A Beer for Idiots. Because it Takes One to Know One. Next, understand your enemy (or competition) and use their weakness to your advantage. Overproduction and vague definition of IPA. Ineffective definition of “craft beer”. And the best part about these problems (at least as far as Big Beer is concerned), is that the craft beer industry is creating them all by itself! Of course craft beer enthusiasts probably already see why these two issues are problematic for the craft beer movement, but let’s spell it out. To paraphrase Ludwig Wittgenstein, the most influential philosopher of the 20th century, the meaning of a word is determined by its use. So what does this have to do with “IPA” and “craft beer”? Well, because of the runaway popularity of IPA within the craft beer market over the last 10+ years, the style has become to a large degree representative of craft beer— the poster child of craft beer, if you will. And because most craft brewers are more than happy to feed into (and profit from) craft beer fans’ insatiable obsession with IPA-anything, the frenzy cycle continues. Simply slap the letters “IPA” on a tap or bottle, and we will almost mindlessly buy, buy, buy— a fact that Big Beer is getting wise to. But here’s the rub: the more IPA that is produced both in volume and variety by craft breweries, the greater the likelihood that people may come to use the term “craft beer” to mean “IPA”. In other words, if the meaning of a word (or term) is determined by its use, and people use the term “craft beer” to mean “IPA”, then “craft beer” will mean “IPA”. Therefore, if “craft beer” comes to mean “IPA”, then Big Beer does not directly need to use the term “craft beer” in its marketing in order to convey and capitalize from the intended meaning of craft beer. Now, it might sound crazy that a general term like “craft beer” could come to mean a specific style of beer like “IPA”, but then again a similar thing happened with the word “corn”. Originally, the term “corn” referred to any type of grain including wheat, oats, etc. In other words, “corn” was once a general term like the term “craft beer” is today. But because of the abundance and popularity of “maize” in the U.S., Americans began to call a specific type of grain (maize) “corn”. And because of the global influence of the U.S., most of the rest of the English-speaking world does now too. But even if “craft beer” doesn’t come to mean “IPA” in some broad sense as “corn” came to mean “maize”, there is nevertheless such a remarkably strong association between IPA and craft beer, that IPA basically implies craft beer. And this tacit implication is all Big Beer needs. But it gets even better… for Big Beer that is. The other problem with IPA, as beer writer Don Russell points out, is that because of all of the divergent permutations of the style, IPA no longer means just India pale ale. There is DIPA, IPL, IPX, White IPA, Red IPA, Black IPA, Session IPA, single-hop IPA, bitter IPA, fruity IPA, Mango Ginger IPA… you get the idea. So why not a Bud Light IPA? 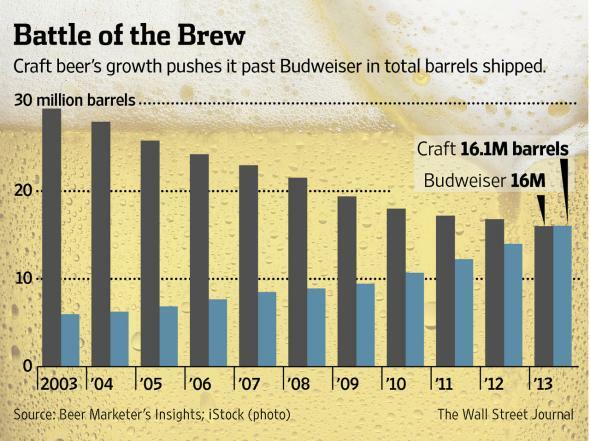 Unfortunately for craft beer, AB In-Bev won’t be the only one crashing the party. By this point, you can probably already guess what Big Beer’s next move is. Well, you don’t really have to guess because it’s already happening. Big Beer is appropriating the term “IPA” (and its strong connotation of craft beer) and creating mass-produced non-craft beer and profiting from the good name and added value that the craft beer movement has toiled to create. Ballantine IPA anyone? Yep, Pabst Brewing Company, the same group that brought you Schlitz, Old Milwaukee, and Colt 45, is stepping into the IPA market. I know what you’re thinking: it must taste horrible. Well, the good folks at BeerAdvocate (a popular beer ranking website) don’t seem to think so! Rated an 87 (Very Good) by the general populous, and 91 (Outstanding) by “The Bros”, it looks like Big Beer is nailing it! If that doesn’t send chills down craft beer’s spine, how about Anheuser-Busch’s take on the hoppy style with their very own Demon’s Hop Yard IPA— rated a 94 by “The Bros” on BeerAdvocate!!! Granted, AB probably jumped the gun with their IPA offering and therefore stopped brewing it back in 2006, but now almost a decade later, the time is all but ripe for that demon to possess the beer market once again. And remember, Big Beer isn’t just after well-informed craft beer drinkers who might know the difference between craft and crafty, yet only represent 7.8% of the overall beer market . No, Big Beer is also after the other 92.2% of the market which includes those who couldn’t tell you that Shock Top or Blue Moon isn’t craft beer, and those who may be aware of craft beer, but only want to stick their toes in the shallow end of the flavor pool. For the Budweiser brand in particular, its message is that the current craft beer scene is just too extreme with their peach pumpkin weirdo concoctions. Budweiser though? Budweiser is safe. Familiar. You don’t have to be a know-it-all beer snob to enjoy our product. Sure we’ll do an IPA, but it will be an approachable IPA with superior drinkability. Something we all can enjoy without having to have a PhD in craft beer to understand. Budweiser: The Craft Beer for Everyone. At this point in the story, rebel craft beer is in trouble. Lando has already sold out his friends, C3PO is in pieces, and Han Solo is frozen in carbonite. There’s just one last piece of bad news before the credits roll. Cheers for now—and may the craft be with you. Like this blartical? Well, thanks- you’re far too kind. Hi, I’m Dan: Beer Editor for BeerSyndicate.com, Beer and Drinking Blogger, Gold Medal-Winning Homebrewer, Beer Reviewer, AHA Member, Beer Judge, Beer Traveler, and Shameless Beer Promoter with a background in Philosophy and Business.